Most of my San Antonio real estate investing portfolio consists of under market value distressed properties that I own in cash. I then owner finance them properties to buyers who lack the credit to buy a home with a bank loan. This type of San Antonio buy and hold may sound risky to many investors, I can tell you that if you do your homework on your potential buyer – verify their employment, income, get at least $5000 down, do a personal interview – you can often get very good buyers who pay you for many years. I own several San Antonio investment properties that I owner financed for $5000, $699 to $999 per month. Some of the investment properties are 2/1s, and many are 3/1s. Whenever possible, I only do a few thousand dollars of clean up on the property, and then I sell it with owner financing to the buyer. Most of my San Antonio owner finance buyers are blue collar workers and they can fix the homes themselves. I do not have too many problems with foreclosures on my San Antonio fixer uppers, but when I do have a foreclosure, it isn’t a major obstacle to my profits. This year, one of the San Antonio homes in my portfolio was 126 E. Dullnig 78223. The homeowner had paid me mortgage payments for three years, but I had to foreclose on the owners when they were 60 days late. I took the house back and spent a thousand dollars to clean it up and get the junk out. It wasn’t in bad shape at all, and I didn’t need to do much. 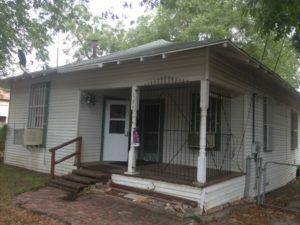 Description: Major cash flow on this San Antonio fixer upper distressed property – 4 beds 1 bath, 1100 sqft, two large storage units in the back, Lot Size: .19 acres, Yearly taxes: $1,600.00, Estimated yearly insurance $700.00, Estimated repairs: 15K, includes interior paint, electrical/plumbing up to code, landscape, trash removal, kitchen/bath updates, central HVAC, flooring, 2 room conversions, foundation/roof repairs. Owner Finance San Antonio wholesale property with 20K repairs: 5k down, $995.00 monthly P/I, 30 year amortization, 10% interest, Price: 99K. Or, owner finance with quick $5k clean up, resell for $79,900. Not every house that I get back works out that well, but I still do fine. Usually, I just clean up the San Antonio foreclosure and resell it with $5000 down again to another buyer. I have gotten some homes back three times and just keep reselling it for the same $5000 down. Previous PostPrevious Buy in San Antonio TX Now Before Prices Double! Next PostNext Start Here To Invest in San Antonio Real Estate Today!